I have been so excited for this book for a LONG time. I could not wait to read the ending to this series. I love how unique this "fallen angel" series is compared to others, the tragedy of Luce & Daniel's love, the way not all the fallen angels are actually Hell's angels or bad. After reading the third book of the series, Passion, I definitely could not wait to finish the series. What I truly wanted from Rapture was more Daniel/Luce time, and Lauren Kate gave it to me. I honestly would have liked more, but hey, beggars can't be choosers. :) We finally get to know how Daniel and Luce FIRST met, and I mean for the VERY first time. And Ms. Kate does a great job of tying all the lose ends together, while still giving us some romance and adventure. I was a bit worn out with the whole love story of Daniel and Luce though, to be honest. I mean, after Passion I just wanted them to be happy and to not have to be living their love over and over without ever truly being together. In my honest opinion, I think the series could have been 3 novels and been better. However, that's just me! Overall, I think this book does a great job of ending the series, giving the readers closure with all the characters, and I think fans of the series will be happy with it. Thank you Ms. Kate, for a great and unique story! I was truly hoping for an ending to the entire series that I could be happy with. I think Lauren Kate did just that. The first novel started out a bit slow but it did pick up. Star-crossed lovers Luce and Daniel are the main focus of this novel but there are still many other great characters like Cam and Arianne. The second novel picks up where the first one left off. New characters are introduced as Luce is placed in a new school. The other angels do make an appearance, but it was mostly about Luce trying to figure out who she was. The third novel was really interesting to me because Luce manages to travel through past lives and find out more about her relationship with Daniel. I'm glad the last novel ended nicely for Luce and Daniel. Filled with mystery, intrigue and supernatural romance it's no wonder this series was a hit! Feeling a bit deflated now I've finished the series and found that the last book, Rapture, did not live up to my expectations! It's a shame because I loved the previous book Passion, and so I'd got really high hopes for this one. I know Lauren Kate can write but I felt like this was a story too far in the life of Lucinda Price. It felt sloppy as I was reading it, not at all like the other books which were well written. However, in the last quarter of the book the writing seemed to tighten up and was more satisfying, but not enough to keep the bad taste from my mouth. A little novella about what happened to the other angels would be great! Finally finished! Nice ending to this series. Finally know Luce's true origin and what she really is. Although, wished there was a mention of what happened to Cam, after everything that happened! Background: Luce, Daniel, and the others are fighting the clock to prepare for their fight against Lucifer. It is only a matter of time before history is rewritten by Lucifer in hopes of making himself more powerful. All the while, Luce continues to uncover her past with the help of her friends. Review: Um....wow... I actually was surprised by how this story concluded, which takes a lot. I cannot really say too much because I do not want to give anything about the story away, but let me tell you, there are twists! Lots of them! and they are super good. Lucinda come into her own very well in this book and the story FINALLY comes together and makes sense. It did however take me a while to get into this one though. I was a little disappointed when book three ended, because I thought it was a trilogy and then it turned out there was going to be another book. When I began reading Rapture, I really wasn't into it. There seemed to be a lag for me, once I hit about the half way point, I flew through it and couldn't put it down. If you recently read the other three and knew there was going to be a fourth book, I think that this will read very well for you. It picks up right where 3 leaves off, and immediately thrusts the reading into the drama and mission. 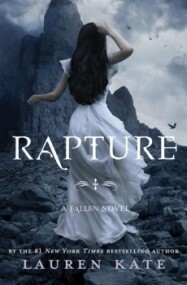 Rapture is enchanting, astounding, and beautiful in its ending to this series. Amazing final! Angels, god, lucifer, knowledge of it all hasn't sent Lucinda Aks Lucy into her normal burst of burning sad death. Why hasent it happend what could that possabile mean? What is she? Is she even Human? With the many, many unanswered question they are all finally answered in 'Rapture' I won't say what the big finally is with these questions but its not something I was ever thinking about. I will say yay they have help in the very end &finally get to be fully together!!!! Loved the whole Fallen series, but this was the best book in the series! A perfect ending to a wonderful series! All your questions are answered, finally! Although the built up was good, it kinda procrastinated in the whole series, but Rapture made up for all that! Luce and Daniel finally having their happy ending! This is the best book in the series! Everything makes perfect since! In fact I might reread the whole series w/ the info Rapture has shown me so I can enjoy the series more and stop being so frusterated! Seeing Lucifer's and Lucinda's past together really brought everything together. I found it so romantic, sweet and fascinating. Of course Lucifer was an abusive boyfriend but it was clear that he cared for Lucinda in his own bad way. Luce's and Daniel's beggining was equally, if not better very romantic. Im serious the last few chapters were the BEST! I was crying, laughing and my heart hurt w/ all of the emotions coming from the angels. Normally Im not into the over lovey dovey stuff but this was so beauitful I seriously cried! Lol anyway the ending was bittersweet for me. I liked that they were able to truely be together but I was sad b/c I wanted them to live forever! They at least deserve to love each other for the rest of time! The last line in the book about them 'falling in love for the first and last time' was so bittersweet! I was apparently sniffing loud enough for my mom to hear and ask what was the matter. Anyway I HIGHLY recommend this book! If you have tried reading the books but lost interest get back on it! Im serious! The last few chapters in Rapture are worth it!!!!!!!!!! I want to thank Randombuzzers for giving me a copy of Rapture!